On September 10, Teachers' Day will come in time. Teachers are not only those teaching people, solidified our minds, who stand on the campus podium. In Shanghai Shibang Company which focus on high-end equipment manufacturing industry, more and more lecturers are also active. Since the 2011 session of the new staff recruited, apart from the regular system training planned by company's human resources, each department has organized a variety of internal training and share. From the old staff's machining process introduction to the new sales staff's experiences share; from old employees' systematic explain of CI and VI to new employees' EXCEL operating skills share ... ... here, as long as you have any special skill, everyone is Lecturer. After graduating from college, Xiao Wang take part into Shibang company's Electric Business Center. After only one year, he gradually responsible for some important work, such as multiple websites content planning, customer needs analysis, etc.. "Training is the biggest benefits that the company gave to me", talking about his own growth, Wang said with deep feeling. After join in Shibang, Wang has participated in 48 times training, both large and small, including the company's products, user experience, photoshop, website optimization, professional attitude and so on. 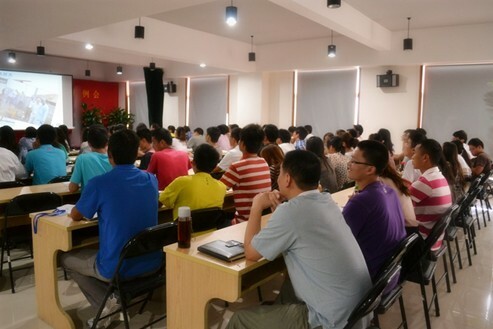 Each year, Shanghai Shibang Company have considerable trainings in training types and courses number. In 2011, by now, company-wide training has reached more than 400 times, including new employee orientation, external professor training courses and so on. Currently, only in training, company has invested more than ten thousand yuan. In the interview, the Shanghai Shibang Company's Human Resources official says: "We create a learning enterprise, not just let employees to improve their learning ability, but also hope employees can live out the meaning of life in their works through their continuous learning, continuous reflection, continuous improve innovation, so as to derive continuous innovation and create a superior continuous of motive power to enterprise's growth."